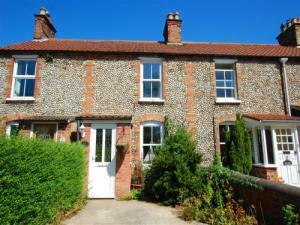 Flint Cottage01263 715779work01603 870304fax Self-cateringThis pleasant flint and brick mid-terrace cottage sits in a peaceful area of North Norfolk within walking distance of Holt's finest pubs, shops and restaurants. This property enjoys large rooms with a beautiful garden for guests to relax in after a long day out pursuing the many activities the local area has to offer. Visitors are presented with a vast choice of activities in the local area including coastal paths, beaches, cycle routes and nature reserves to investigate. This pleasant flint and brick mid-terrace cottage sits in a peaceful area of North Norfolk within walking distance of Holt's finest pubs, shops and restaurants. This property enjoys large rooms with a beautiful garden for guests to relax in after a long day out pursuing the many activities the local area has to offer. Visitors are presented with a vast choice of activities in the local area including coastal paths, beaches, cycle routes and nature reserves to investigate.